The power amplifiers are constructed in two forms, discrete and integrated , and a called hybrids . A discrete amplifier is one that is built, transistor transistor; ie, each transistor stage is independently constructed element by element. A transistor amplifier can have many transistors and several stages of amplification, but usually just six (6) transistors to achieve acceptable power amplification. This type of high power amplifiers circuit can achieve and are favorites for their performance in the field of high fidelity. An additional amplifier is one that in your power amplifier has a positive base transistor and one negative base and work as complements. The transistor is NPN handles amplify the positive half cycles and PNP handles half cycles negative. Between the two form the complete cycle of the sine wave. 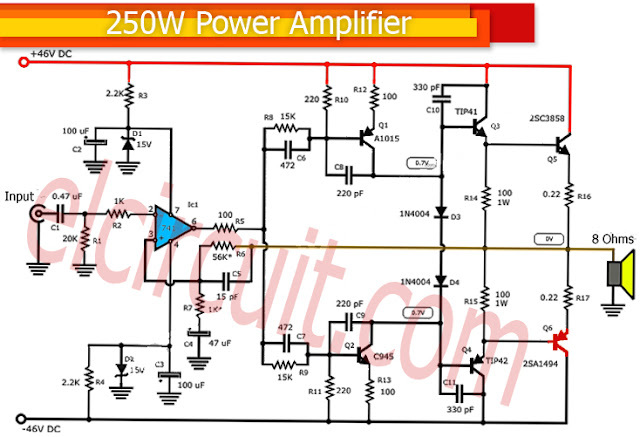 The additional amplifiers are the most common in the market power amplifiers. Its performance is very good and his fidelity is acceptable, although not the cleanest sound. Then we explain why. The transistors have a gain determined by the manufacturer. This is called hFE or Beta . A transistor between more potent, beta is lower. For example , a transistor A1015 which is a small transistor has a beta of approximately 180. But a transistor 2SC3858 is a high power transistor has a beta of approximately 30. The odd thing is that if we measure the beta of the complementary transistor 2SC3858 , which is the 2SA1494 , we find that measures roughly 100. This is strange, but it is. The performance of a transistor NP N is better than the transistor PNP. In conclusion: As the transistor NPN has a different response to the PNP , when crossing wave distortion is generated called crossover distortion , which for more than design and calibration of BIAS is perfect, there is such distortion. I want to clarify that I am not saying that complementary amplifiers are noisy, however are cleaner than many integrated amplifiers, but if you have more cuasicomplementarios noise amplifiers. Of course I'm talking about a noise that can only be heard by an expert in sound or seen with the oscilloscope. For normal ear sound perfect. Is called amplifier quasi-complementary that amplifier having on its output transistors of the same polarity to both the positive half cycles and negative half cycles. Here we present a amplifier transistor NPN . We take the NPN amplifier and we made some small modifications, changing places a pair of resistors and few clues. Basically what needs to be done to convert a amplifier NPN , is changing the resistance of 0.22 ohm polarizes the transistor PNP ( R17 ). 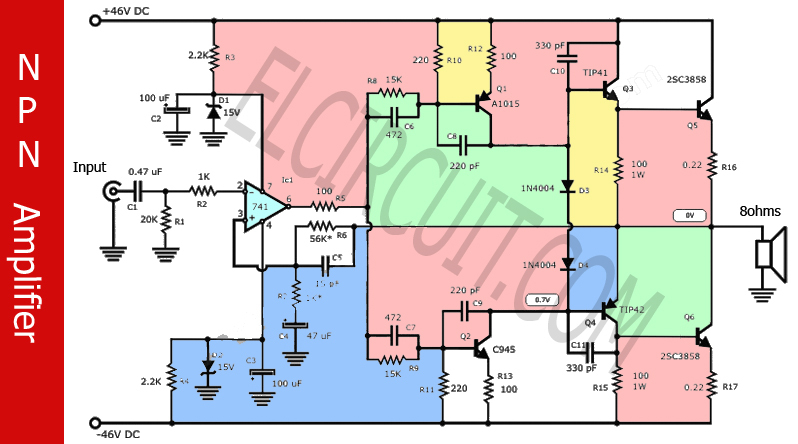 This resistance is located between the emitter of transistor PNP and output. By switching the transistor PNP by one NPN , resistance becomes between the emitter of transistor new and Vcc . The base of transistor PNP would drive transistor to the emitter of TIP42 . Now the transistor NPN takes its base connected to the collector of TIP42 and resistance of 100 ohms ( R15 ), which was between the emitter of the TIP42 and output, now goes between the collector and Vcc . With only those changes already have an amplifier NPN cuasicomplementario .